Actually still a very decent zoo card (especially if you're new and don't have the resource to get Malchezaar's Imp, etc.) I think this is one of Blizzard's best balance changes that didn't entirely ruin the card but also kept it from auto-include. The nerf here is actually pretty deserved. The +2 attack and the 2/1 stats made for some efficient burst damage and worthwhile early game trades. I've won a lot of games off of the things that this card has enabled. 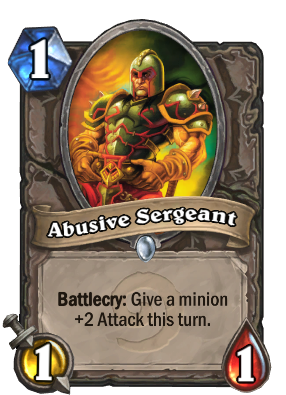 Fun Fact: Blizzard had this as a 1/1 originally and buffed it to it's current state, only to nerf it back to its original state. Well played. It will still see more play than Leper Gnome, +2 for trading is much better than 2 to the face. I was surprised they didn't change this card during the last update. Why? Just why? un-nerf Maggot! This probably needed the nerf with the efficient trades it enabled. Really? This is the icon of aggro and some midrange decks. I dont think it was really necessary. now THIS is a card. The NEW face of SMOrc! Fun fact, this was the first card I ever crafted. have you ever not liked golden animation? The way his voice sounds like it's about to crack when he goes "Suffer my wrath! ", I had a drill sergeant whose voice used to almost-crack in the exact same way, really love the voicework.